Although taking online courses does not require a high level of technical competency, familiarizing yourself with using computers and engaging in Web-related activities, as well as having access to the required hardware and tools, are critical factors in successful online learning. You should have some basic knowledge about how to navigate the Internet, how to use search engines, how to use computer operating systems (Windows/Mac OS), how to send and receive e-mails, how to use a word processing program to edit your writing assignments, and how to use course tools such as discussion forums and drop boxes. Familiarizing yourself with those tools will help you reduce your frustration while engaging in online learning activities. To determine how many hours you need to study each week to get A’s, use the following rule of thumb. Study two hours per hour in class for an easy class, three hours per hour in class for an average class, and four hours per hour in class for a difficult class. For example, basket weaving 101 is a relatively easy 3 hour course. Usually, a person would not do more than 6 hours of work outside of class per week. Advanced calculus is usually considered a difficult course, so it might be best to study the proposed 12 hours a week. If more hours are needed, take away some hours from easier courses, i.e., basket weaving. Figure out the time that you need to study by using the above formula for each of your classes. Compare this number to your time left from the survey. 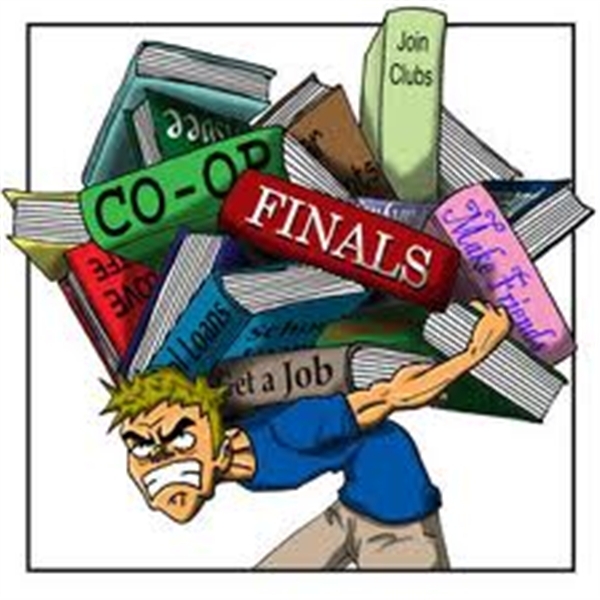 Now is the time when many students might find themselves a bit stressed. Just a note to ease your anxieties. It is not only the quantity of study time but also it’s quality. This formula is a general guideline. Try it for a week, and make adjustments as needed. There are a variety of time schedules that can fit your personality. These include engagement books, a piece of poster board tacked to a wall, or 3 x 5 cards. Once you decide upon the style, the next step is construction. It is best to allow spaces for each hour, half-hours for a busy schedule. First, put down all of the necessities; classes, work, meals, etc. Now block in your study time (remember the study time formula presented earlier). Schedule it for a time when you are energized. Also, it’s best to review class notes soon after class. Make sure to schedule in study breaks, about 10 minutes each hour. Be realistic on how many courses to take. To succeed in your courses you need to have the time to study. If you find you don’t have time to study and you’re not socializing to an extreme, you might want to consider lightening your load. Tips for Saving Time Now that you know how you spend most of your time, take a look at it. Think about what your most important things are. Do you have enough time? Chances are that you do not. Below are some tips on how to schedule and budget your time when it seems you just don’t have enough. Prioritizing your responsibilities and engagements is very important. Some people do not know how to prioritize and become procrastinators. A “to do list” places items in order of importance. One method is the ABC list. This list is divided into three sections; a, b, or c. The items placed in the A section are those needed to be done that day. The items placed in the B section need completion within the week. The C section items are those things that need to be done within the month. As the B, C items become more pertinent they are bumped up to the A or B list. Try it or come up with your own method, but do it. After scheduling becomes a habit, then you can adjust it. It’s better to be precise at first. It is easier to find something to do with extra time then to find extra time to do something. Most importantly, make it work for you. A time schedule that is not personalized and honest is not a time schedule at all. People define success differently. For some, success means having achieved financial security or career pinnacles. Some people judge their success by the positive impact they have made on others whether these are clients, students, associates, or family. Other successful people have acquired a level of expertise that is recognized and respected by peers. But despite these differing definitions of what constitutes success, successful people themselves have similar characteristics. First, they are self-confident without being arrogant. This comes from being self-aware: knowing one’s strengths and weaknesses, knowing one’s goals and remaining true to one’s value and capabilities. Second, they are willing to grow by challenging their limits of knowledge and experience. And third, they are willing to reflect and learn from experience. In contemporary times, groundbreaking research by the Center for Creative Leadership in the late 1980s found that successful executives were those who had benefited from the “lessons of experience.”So from these common traits of successful people, those striving for success can seek to practice three fundamental steps to self-development. This is the most basic tenet of psychology, self-improvement, and emotional intelligence. If you think you need to get to know yourself better, try these basics. Solicit Feedback Regularly: Perception is reality. Seek to understand how people perceive you. You may not be achieving the impact you expected in leading or working with others. You can not adjust your approach without the benefit of feedback that can inform you in terms of how your intentions were received by others. Be proactive in finding out what people think about you and your style of interacting and your approach. Be open to and appreciative of the feedback you receive, not defensive. Seek to understand rather than to be understood. Reflect on Performance: Some successful people are gregarious and extroverted while others are reserved and introverted. But all successful people know how to spend time alone being reflective and thoughtful about recent performance and behavior. Take time every day to reflect on the day’s work and interactions. Always take ample time at the conclusion of major elements of work to reflect on the quality of what you produced and the effectiveness of your work with others. The key to reflecting on performance is remaining balanced in your self-assessment. Be self-critical: understand what you could have done better and learn from these mistakes. But also acknowledge success whenever warranted: celebrate and take pride in what you have done well. Know your Strengths and Weaknesses: As you collect feedback and reflections, come to understand your personal strengths and weaknesses. Know that everyone has both. Successful people build success from their strengths while they limit the negative impact of their weaknesses. The reason to identify your key strengths and weaknesses is not so that you can improve your weaknesses. It is much more important to identify your key strengths and leverage these. Know Your Joys and Passions: Be in tune to your emotions as you engage in your work. We all need to do elements of work that are tedious or displeasing, but the bulk of how you spend your day should satisfy you and make you feel good about your contributions and the impact of your efforts. Success is difficult to achieve without that level of satisfaction. Know that people who excel enjoy what they do and do what they enjoy. When you are actually looking for a job, it is always a “bad” market. Today’s market just happens to be a little more so, especially if you happen to be an autoworker or a “big law” associate. But while many people lost their positions during the “Great Recession,” others have found interesting and rewarding jobs. There is no magic formula for finding a job, but there are ways to take control of the process and enhance your odds of finding a job. Here are 10 tips for finding a job in an economic wasteland. 1. Know what it takes. Different fields have different application requirements, and you need to know what those are for the field you are interested in. 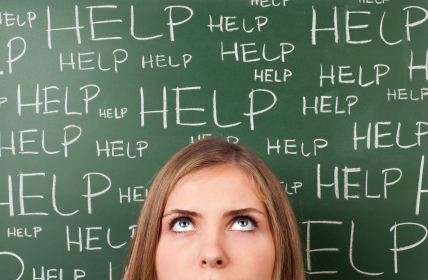 Do you need a résumé, a cover letter, a writing sample, a portfolio, etc.? You also need to know what these materials look like in your field and which skills and experiences you need to emphasize. A legal résumé is different, both in form and content, from a management résumé, which is different from a marketing résumé. Don’t have a clue? Try to arrange an informational interview with a professional in the field to which you aspire to learn what it takes. 2. Perfect your application materials. Always have your application materials reviewed by someone who is a better editor than you are. After polishing and massaging your résumé 100 times, you are probably too close to see the nits that need to be picked. Have your materials reviewed again whenever you make revisions or add updates. Don’t know any good editors? If you are in school, try your career services office. 3. Activate your network. Tell everyone you know what type of job you are looking for. There is no sin in looking for employment, so you need to get everyone in your network working for you. While your hair stylist is not a lawyer or a management consultant, he or she may know one. Follow up every lead you are given; you never know who knows the person who can get you the job you want. 4-Star Tip. If you have a professor who has worked in industry or does extra work in the field you’re considering, make sure to invite him or her to use their contacts on your behalf. Often, even an informal recommendation from a professor can open doors. Extra-Pointer. If a parent, family friend, older brother or sister, or employer of yours works in the field you want to go into, enlist their help, too. You never know who has the contacts that count. 4. Join a professional organization. Most occupations, from restaurant professionals to engineers, have professional associations. Join one. (Many have student rates.) Attend meetings, go to seminars, and read the materials. Like an anthropologist, learn the language and customs of your field, the issues of the day, and identify the key players, so that when you land an interview, you will “speak the language” like a native. 5. Be patient and persistent. Set aside time every week to check for job postings, to do research on employers in your field, and to send out a manageable number of applications. It is probably not realistic to try to send out 20, letter-perfect, individually tailored applications in a weekend, so pace yourself. It is better to send five high-quality applications than 20 generic ones. Treat the job search as a marathon rather than a sprint. When you work on the job search regularly, rather than in fits and starts, it is easier to stay focused and to control the stress that inevitably accompanies the job search. 5-Star Tip. MyColLife Career Tab will help you in your job search. They provide job search tips, career research information, company profiles, and many other features. 6. Don’t treat an interview as an interrogation. If you are fortunate enough to land an interview, treat it as an opportunity to establish a professional relationship with the interviewer. Know the employer, and be prepared to ask intelligent questions. Engage with the interviewer, and do not be shy in letting the interviewer know how much you know about the employer and how much you want to work there. Be enthusiastic, not desperate. Extra-Pointer. It’s always a good idea to do a little Web research before the interview on the company—and, when possible, on the individuals—that will be interviewing you. You’ll make a much better impression when you know what the company is doing and how you might fit in. 7. Practice out loud. Try to anticipate the types of questions you will be asked, and practice your responses. If you lack experience or feel uncomfortable in interviews, find someone to do a mock interview with. Like any other skills, communication skills get better with practice. And though you may think you have a perfect answer in your head, you won’t know it until you actually articulate it. In an interview, there is the answer you plan to give, the one you do give, and the one you wished you’d given. With practice, those three answers come together. 8. Be “on” from the start. In this age of security cameras, you may be recorded from the moment you hit the employer’s parking lot. Act as if the employer is watching you from the outset. Dress the part. Be friendly and respectful to everyone you meet. Stay focused. Even if you are left cooling your heels in the reception area, do not be tempted to check your phone. If you cannot resist the temptation, leave your phone in the car. 10. Be positive. Stay upbeat throughout the interview. Smile—it will register in your voice. Do not let the interviewer’s facial expressions or tone of voice throw you off your game. Do not assume that a particular answer is “wrong” or that you have “blown it.” Stay confident. If asked about a perceived negative, do not make excuses or provide elaborate explanations. Give it one sentence, and move on. Remember that there is no “perfect” candidate; just be the best you can be. Redundancy isn’t usually welcome, but it is something that happens to many of us during our working lives. However, it is not necessarily a negative situation to be in; many people have used it as an opportunity for positive change in their lives and careers. What is important is how you react to a situation which is not of your making. Redundancies can be caused by any number of situations: falling profits, lack of trade or orders, increased competition, advances in technology, changes in legislation, even poor management are just a few of the many causes. Remember, though, employers and companies don’t like making anyone redundant. It could mean that they, too, will become redundant. Employees, however, have varying degrees of protection to help them overcome being made redundant. If you had resigned or given notice, that protection would not necessarily have been there. This page will provide you with guidance in dealing with your situation. feel negatively about the company that made you redundant. One thing is certain: it’s a time of change. Many of us find change a bit unsettling, but remember that it can also be for the better. Important information on what to do if you are made redundant. get written details of your redundancy payment and package. If your employer offered any benefits such as health insurance, note the contact details of these too. What extra benefits might my employer offer me? Your employer might provide free careers guidance to help you decide on your next move. Some will offer money for training. Remember to ask. Whatever they offer, make the most of it. How do I find out what I’m entitled to? Redundancy issues are complex. You should get help from a professional adviser who can explain your rights and look at your financial options. What if I feel upset about losing my job? It’s only natural to feel upset. It can be a stressful time but there are people who can help you cope. Remember that you can speak to a counselor, who can help you make sense of what you’re feeling, put things into perspective and support you in moving on. Check with your employer, too, to see if they are part of the Employee Assistance Program that provides free practical and emotional help to workers and their families who are going through difficult times. Don’t rush your decision – although you might have concerns about money, a quick fix might not be the best way forward in the long term. Weigh up all your options carefully – this way you’ll make the best decision. You can find information on this site that can really help you to make more informed decisions about your future. Find courses that improve your skills, find information on hundreds of different types of job and advice on how best to get back into employment. Consider the process of studying for class as ongoing. Approaching it this way helps you avoid study marathons and allows you to review content in shorter, more frequent sessions. Spend two to three hours studying outside of class for every hour in class. Listen to the lectures and read the texts, but balance those activities by finding ways to write, speak about, and graph or draw the content you are learning. Prepare for Success:Study when and where you are most alert and plan your time. Preview, Read, Recall:Identify relevant text or notes; scan chapter headings, keywords and diagrams; read chapter intro and summary; and formulate questions you want to answer. Read actively, find answers to your questions, take notes during lectures, and synthesize lecture and reading material. Talk with your professor, TA, or other students and consult your textbooks to fill in gaps and correct misunderstandings; put the main ideas of lectures and readings into your own words. Self-Test:Create possible test questions, keeping in mind different levels of learning. Do practice problems and apply your knowledge to real-world solutions. Trade and discuss your questions with a partner or a group. 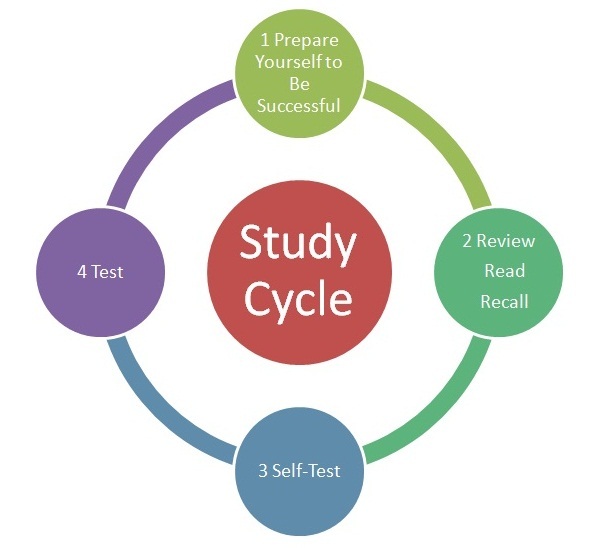 Test:Arrive early with all necessary materials, use appropriate test-taking strategies, and analyze returned tests.